Heat a non-stick skillet over medium heat. Add the chorizo and sauté until it is cooked through and has rendered its fat. Remove the chorizo with a slotted spoon and set aside. Replenish the pan with oil. Add the onion and garlic and sauté until soft and translucent, about 5 minutes. Add the diced tomatoes and pepper. Reduce the heat to low and simmer for 10 minutes. Re-move from heat and add the cilantro. Place a heaping 1/2 cup of the chorizo-pepper mixture in each ramekin (6 in total). Crack an egg into a small cup and gently drop into each ramekin. Place in the oven and bake until the whites are set, 12-15 minutes. Garnish with oregano and sprinkle with sea salt and freshly ground pepper to serve. Roasting brings out the flavor in poblano peppers. While prepping the ingredients, place the poblano pepper underneath a broiler, turning frequently, until it is blistered on all sides, about 5 to 7 minutes. Remove from the broiler and place in a plastic bag to cool. Peel the skin away, stem, and seed. The last thing you want when you’re hosting a brunch is to find yourself chained to the stove poaching eggs or flipping frittatas after your guests have arrived. 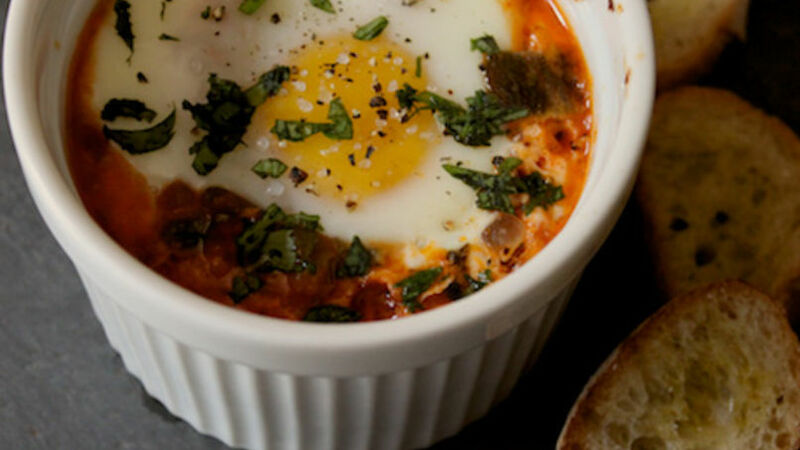 Eggs cooked inside a chorizo and roasted pep-per sofrito and baked off in the oven all at once are a delicious solution. Choose a Mexican chorizo that comes pre-seasoned with chiles, paprika and oregano for added spice and heat and prepare the pepper mixture in advance. It will give you more time to enjoy you company, which is the point of entertaining in the first place!